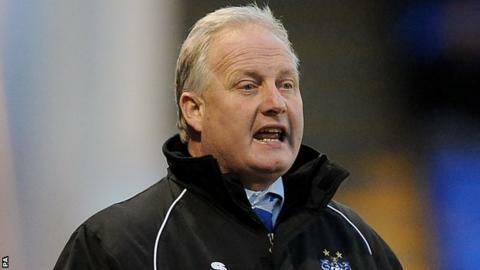 Bury boss Kevin Blackwell believes there is enough quality in his squad to avoid relegation from League One. Following Tuesday night's 2-0 defeat by Sheffield United, Blackwell's side lie five points away from safety. "We know we can compete in this division and that's the thing the players have got to take on board," he told BBC Radio Manchester. "They're in this division by rights and they can stay here by rights, they are good enough to do that." He continued: "As I said from day one, it would always be ups and downs." "This will never be a smooth running play that will see us slide out. It will be a battle to the end and that's what's going to happen." Despite their lowly position, Blackwell says he has had no problems with the squad's efforts since he replaced Richie Barker in the Gigg Lane managerial post. in September. "I've got no qualms with they way the players have given me everything since I've been here," he added. "There's very few days I can say I've been really disappointed."